I was privileged and honored to represent Simply Stacie at the 2013 Krispy Kreme Blogger Summit in beautiful Winston-Salem, North Carolina. The Krispy Kreme team really delivered what they promised for this trip – a total sensory experience! 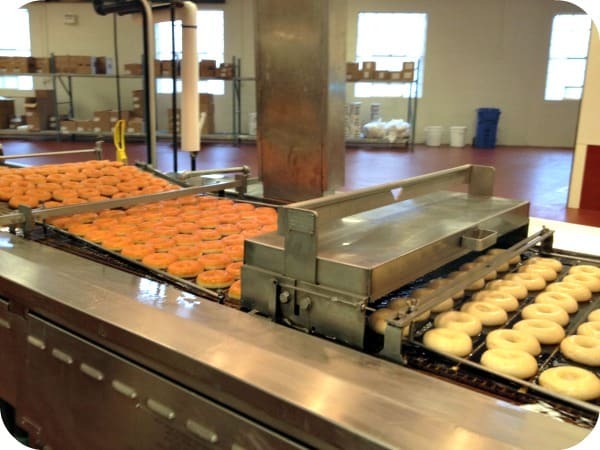 Upon landing in North Carolina, I was immediately taken to the Krispy Kreme factory for a behind-the-scenes tour of all things Krispy Kreme. My fellow bloggers and I were able to walk through the creation of Krispy Kreme products and learn about the history of this great company. We were educated on ingredients, the different lines of products from wholesale to retail, nutritional information, and more. 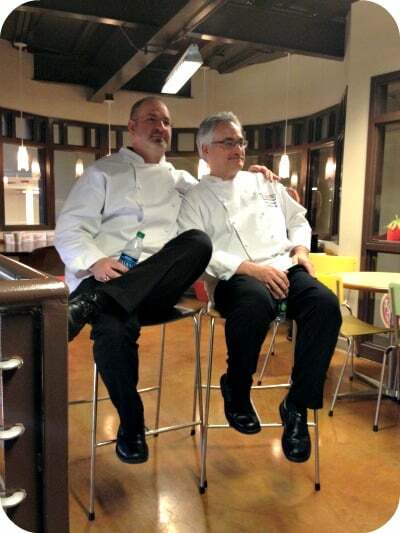 We were even given a coffee and doughnut pairing lesson from corporate chefs Ron Rupocinski and Mark Susz, who then stayed around for a live Tweet chat! My favorite pairing from the session was the smooth Latin American Krispy Kreme house blend coffee with the blueberry cake doughnut. I highly recommend it! Before this trip I had no idea of what a great international presence Krispy Kreme has – it really is a worldwide brand with stores in places like Sydney, Australia, Asia, Mexico and Turkey. During the summit the mission statement of Krispy Kreme really came to life: To touch and enhance lives through the joy that is Krispy Kreme. Everyone I came in contact with showed real passion for working for Krispy Kreme and really showed a lot of excitement for not only their jobs, but for the fans of Krispy Kreme as well. After the factory tour, we were treated to a taste of the real old Winston-Salem with tours of some of historic homes and landmarks (including the spot where the first Krispy Kreme was opened!). 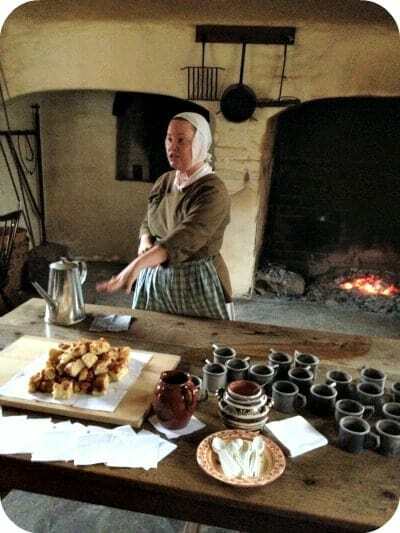 We even got to sample some great old local recipes – Carolina Snow Balls and Pumpkin Cornmeal Pancakes – and got to see tailors and potters at work just as they would have been hundreds of years ago. At dinner we sampled local wines paired with some fabulous cuisine. I really got a great insight into this great little town and great state, and I plan on going back with my family in the future for vacation. There really is a lot to see and do in Winston-Salem. 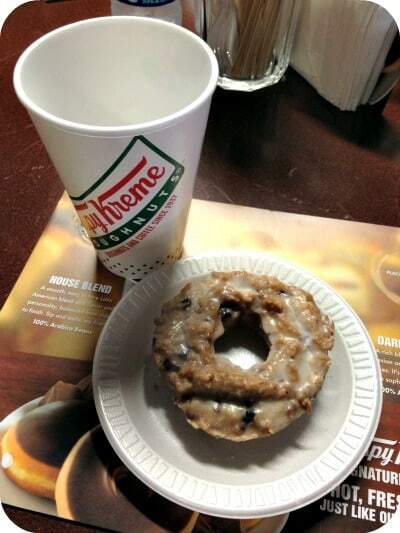 To learn more about Krispy Kreme, visit their website. While you’re there, sign up for their Friends of Krispy Kreme newsletter which will keep you in the loop about new products, special offers and local events. You can also find them on Facebook, Twitter, and YouTube. For more about the Krispy Kreme blogger experience, check out the hashtag #kkbloggers2013 on Twitter. That would have been so interesting to me! I remember when I was in grade school in California, we went to a bakery for a field trip. They gave each one of us a free loaf of bread. My first freebie! This is so cool!! My husband absolutely loves krispy kreme so I will have to put that in when we go on vacation!!! I’ve lived in NC for 12 years and never knew they did this. I need to look into this for next year. I love your website! Good lord that would be a dream day for me! Wow! 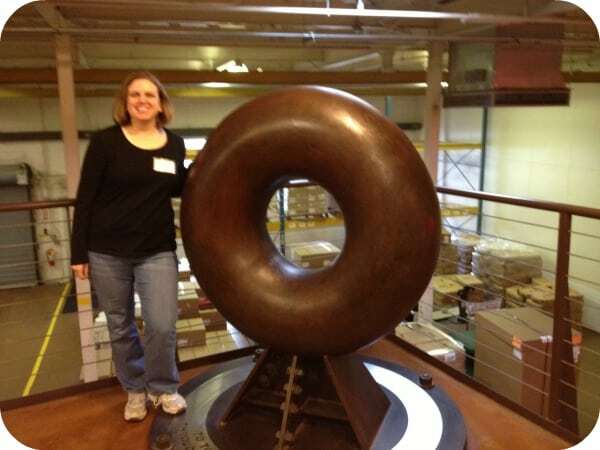 That is one big donut. I’d love to visit this place! Looks like an interesting tour! I didn’t know that Krispy Kreme was sold in other countries. There used to be a Krispy Kreme store in our state. Sounds like you had fun. I didn’t know they were in Winston Salem. Not that far from me.how cool.